A new type of science fiction, so realistic it could actually be happening – real science, real characters, real humanity, real drama. 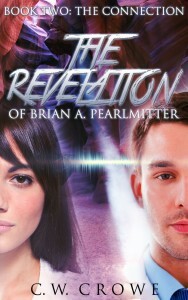 The Revelation of Brian A. Pearlmitter continues in Book Two: The Connection. Planned as a multiple volume, continuous story arc, Book Two finds Roger Seaton and his best friend, Jane Mitchell, on a seemingly normal business trip – but this is a trip that will change their lives forever. Roger and Jane are the only two who know that Roger is receiving a revelation from an unknown and probably alien entity. Not only does this entity promise to reveal why humans are on Earth, he also promises to disclose the purpose behind it all. The Revelation is disclosed one piece at a time, always building upon the pieces that came before. But Roger and Jane share more than their knowledge of the unfolding Revelation – they find that they are being changed by the experience. This change allows them to emotionally “Connect” to each other in a way that is both exciting and also frightening. The story reaches an early pinnacle as Roger uses his new found abilities to perform a very public miracle, which ultimately leads several new members to join with Roger and Jane in a group they name The Connection. Each character is rendered in three dimensional realism as the cast expands. Roger struggles under the weight of his unwanted leadership role, while Jane provides more than enough strength for both of them. They need every ounce of that strength as events provide a challenge that may be too big even for their entire group – a challenge that results in a shocking and heart wrenching end to The Revelation of Brian A. Pearlmitter, Book Two: The Connection.